During the mid 1800s, America faced two crisis. The Civil War devastated the South, leaving it in “political turmoil” and “economic devastation.”1 In the North, immigrants amassed bringing with them new challenges. Unfortunately, the North experienced its own devastation – compromise. The Baptists in the North made some fatal errors: 1) They changed their evangelistic strategy, adopting what is commonly called the “Social Gospel.” 2) They became enamored with the educated German liberals and adopted their theology. Many Baptists went to Germany to receive their education. These factors set the stage for the downgrading effects of liberalism among Baptists. Entering the 1900s, the Baptists were faced with certain obstacles (financial and organizational) so they developed the Northern Baptist Convention. Unbeknownst to the majority, Liberals and Moderates had their own agenda to dominate and control the Baptist denomination. However, among the Baptists were some who “rocked the liberal boat.” They stood against the liberal theologians and strongly opposed their institutions. They began the Baptist Bible Union. In the last lesson we looked at the rise of certain societies – American Baptist Missionary Union (Triennial Convention), American Baptist Publication Society, and the American Baptist Home Mission Society. These were the strongest three of eight societies which existed in the north. The other societies were the Education Society, Woman’s Home Mission Societies (east & west), the Foreign Bible Society, and the Young People’s Union. Hindsight would show that a major underlying reason for combining was so that the liberals could control the Baptist denomination. The NBC was doomed from the beginning. They were a doctrinal melting pot. Among the Baptists were various strains of belief (and unbelief). Many leaders spoke of a “New Theology”. Though not new, it was old German rationalism which denied the deity of Christ, his atonement, Creation, and the inerrancy of the Bible. The Arminian Freewill Baptists were added to the convention in 1911. They were concerned about adapting to their culture. As dean of the University of Chicago Divinity School (1908–1933) and leader in the Chicago Baptist Association, he wielded great power. He was an ardent liberal and advocate of the social gospel. He served as president of the Federal Council of Churches (1912–16) and president of the NBC (1915). Mathews was also responsible for much of the content of the new convention’s constitution. His book, The Faith of Modernism (1924) is a classic defense of the social gospel. While claiming in this work that modernism is evangelical, he teaches universalism, and makes “science,” rather than the Bible, the final authority for man. by Gerald Priest, Ph.D. The Rockefellers were members of the Park Street Baptist Church in New York. They were very generous in their giving to the schools. 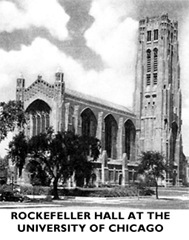 A large pledge by Rockefeller was used to begin the University of Chicago. Nearly every Baptist school in the North received a gift from the Rockefellers.7 It would seem as if charitable gifts were given with “no strings attached.” However, their influence was felt and made known at certain times. Liberals and Moderates comprised the majority of members in the convention. Liberal institutions and projects received financial support, whereas the orthodox did not. The Fundamentalists were against an immovable obstacle. The Liberals and Moderates were far too numerous. The key problems were “heresy in the schools,” “heresy among missionaries,” and “heresy in the literature.” The Fundamentalists smartly began to have pre-convention strategy meetings to combat these problems. 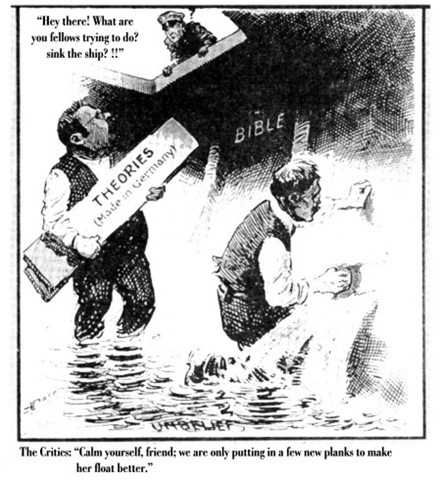 Beginning in 1920, the Fundamentalists began their fight, only to lose in the end. At the pre-convention meeting, the fundamentalists determined that J.C. Massee handle the floor at the Convention. The Fundamentalists wanted to “sell The Baptist” a liberal magazine. Since the magazine was losing money and discouraged Modernists would likely side with the Fundamentalists on the issue, it was a flawless strategy, so it seemed. 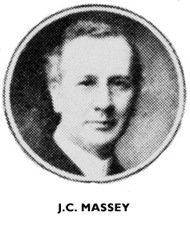 When it came time for Massee to make the motion, he “caved in.” He said, “Well now look, brethren, we ought to show ourselves to be Christians, and let’s not be radical. Let’s give it to the committee and let them study it and wade through it, and bring it back next year.” This change on the floor discouraged the Fundamentalists. Massee also made a motion to investigate the schools for heresy. This brought on a vicious debate (”hissing” and “stomping”). By the end of the day, Massee had agreed to a series of substitute resolutions which effectively nullified his motion to investigate. A committee was established to do the investigation, however, the committee was made up of liberals and moderates. It was no surprise to the Liberals and Moderates that the Fundamentalists would urge a Confession upon the Convention. However, it was a surprise when the matter was dropped. It became clear that the Fundamentalist leaders were not separatists. This conciliation led to the Des Moines defeat. Back to the committee on heresy in the schools . . . The committee reported, the schools “are doing a work of which the denomination may well be proud.” Again, another loss to the Fundamentalists. Again, at the pre-convention meeting, the Fundamentalists agreed to present the motion to the Convention to adopt a confession of faith, namely the New Hampshire Baptist Confession. When the resolution hit the floor, Cornelius Woelfkin, a liberal pastor from New York, said, “The Northern Baptist Convention affirms that the New Testament is the all-sufficient ground of our faith and practice, and we need no other statement.” How could a Baptist deny this? It is a disingenuous statement to come from a liberal. Liberals deny the authority of the New Testament in matters of faith and practice. It pits the New Testament against the use of confessions. The apostles used confessions and encouraged their use. It is a cover for unbelief. If Moderates do not have to subscribe to a statement of belief, it is difficult to prove their belief system. Confessions describe one’s understanding of the Bible. They are also tools to protect against apostasy. Hence, simply affirming that the New Testament is the ground is a cover-up for unbelief. 1. You cannot attempt to work together for the cause of Christ when there are theological differences. The NBC brought Baptists of various stripes under the umbrella of one Convention. 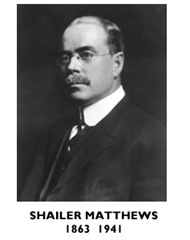 Matthews was either naïve or insincere when he stated that he did not arouse controversy. 2. The mission of the church is not to “lead into more sympathy with the world, or remain relevant with the world.” This love talk leads to doctrinal deviation. 3. Place only tested, faithful people in leadership positions. On more than one occasion Massee “dropped the ball.” When it was time to stand and fight for truth, he did not stand. This failure led to at least two sound defeats for the Fundamentalists in the NBC. 4. Many cliches and quotes used by Christians today did not originate with conservative, Bible-believers. For instance, the statement “We do not use creeds, only the Bible” is often used by those who want to cover their apostasy. We must use confessions to guard ourselves from apostasy. 2 Robert Delnay, A History of the Baptist Bible Union (Piedmont, NC: Piedmont Bible College Press, 1974), 7. 4 Rochester by 1912, Newton by 1914, Crozier by 1915, and Colgate by 1918. 8 That is not to say that Fundamentalists did not get to speak. When they did, they were the majority. In many cases, they were “hissed.” On one instance, a Fundamentalist spoke on the errors of liberalism. After his speech, he was applauded, not because the people were in favor of him, but because he listed their beliefs. Does the Northern Baptist Convention ordain feminist?